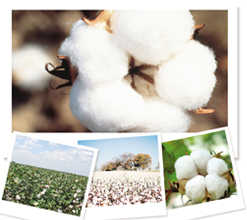 Raw cotton is procured from the prime areas of the Pakistan. Fully devoted, technically trained and experienced staff is appointed to select the best quality cotton from the cotton fame areas of Pakistan. To ensure the fiber quality, cotton ginning factories are selected with extra labor strength for contamination picking to control and reduce the contamination. USA cotton is also used to produce the contamination free yarn to fulfill the needs of the valued customers. To further ensure the quality of yarn and reduce the contamination to minimum level, the company has deployed a large team of workers to collect the white contamination by hand. "Card is the heart of the spinning mill"
Combing of the fiber is also being performed by the Reiter made combers E- 65 which help to reduce dirt and short fiber. It also plays vital role in getting optimum geometry of combing, strengthening and making the fiber more parallel in order to have a smoother, more uniformed and stronger yarn. Drawing is the final process of quality improvement in spinning industry. The auto leveling system of the RSB-D35 draw frames guarantee constant sliver quality. The sophisticated regulation system with reliable and precise scanning, produces consistent long-term count stability and results in high yarn quality. Simplex is an intermediate process in which fibers are converted into low twist lea (Roving). To make the quality roving, Toyota made FL-100 machines are installed to perform the smooth Roving production process. The consistent quality yarn is backed by the quality roving process. Ring department is equipped with state of the art Reiter compact ring frame K-44 and Toyota made RX-240 with complete auto doffing system. Fleece angle prevents fluff and provides excellent yarn twisting resulting in high quality yarn. A high-precision coil spring maintains a consistent balanced pressure to produce high quality yarn. The automatic doffer works quickly, reliably and precisely. At Alam Cotton, Murata made 21-C cone winding machines with Uster Quantum-II wind the yarn over cone smoothly. The air-type hairiness reduction system is prime feature of this machine. The Bal-con balloon controller reduces fly waste generation, neps and hairiness in the yarn. High quality yarn is further strengthened by a fully automatic Welker made computerized conditioning machine to inject the uniform moisture to complete production.